Befitting its midrange aspirations, the Asus Zenfone Selfie comes with the Qualcomm Snapdragon 615 under the hood. In this particular case the clock speed caps are set at 1.5GHz for the pseudo-big quad-core cluster of Cortex-A53's, and 1.11GHz for the other four cores. Our review unit has 3GB of RAM and 32GB of internal storage. There is a lower-specced version with 2GB of RAM and half the storage. It's natural that the 2GB of RAM may adversely affect some (but not all) of the tests, so have that in mind when sifting through the numbers below. Sticking to our usual drill, we kick off with the GeekBench 3.0 benchmark. 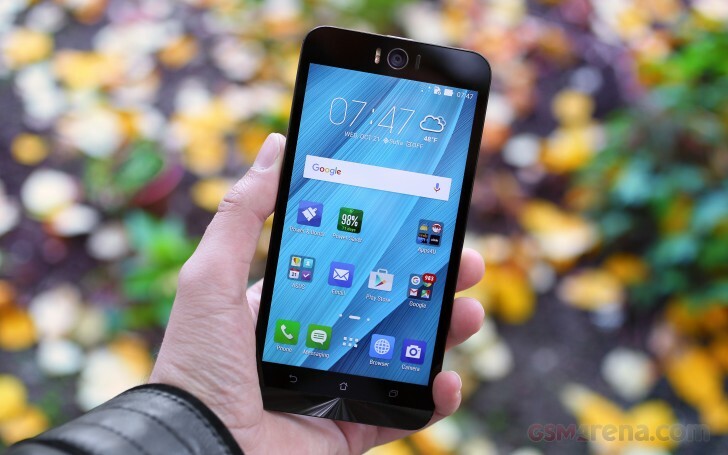 The Zenfone Selfie scores a lot like you'd expect from a Snapdragon 615 device. It's on par with the similarly equipped Moto X Play and marginally ahead of the Zenfone 2 with the lesser of the Atoms, the Z3560. The Exynos 7580 in the Samsung Galaxy J7 is ahead in raw CPU power, as are the Xperias C4 and C5 Ultra. In Antutu the Zenfone Selfie posts good numbers, among the top Snapdragon 615's we've seen. It more than likely thanks to the 3GB of RAM, which can show its benefits in this compound benchmark. The more powerful CPU helps the Galaxy J7 inch ahead, despite it only has half the Selfie's RAM. The Xperias are towards the top of the crop, where you can find the top-specced Zenfone 2 with the Aton Z3580 and 4GB of RAM. The overall score in Basemark II 2.0 isn't impressive on its own, but it's still higher than the Moto X Play. The Zenfone Selfie is also comfortably ahead of the Galaxy J7, though it still can't match the Xperias. If you want to beat them with an Asus smartphone in this benchmark, you'd have to go with a Zenfone 2 ZE551ML, and even the Z3560/2GB model will suffice. Single-core performance of the Selfie is quite good, almost matching the Xperia C4 and C5 Ultra and again beating the Galaxy J7. The powerful Mediatek's in Sony's models show their strength in the multi-core results easily beating the Zenfone Selfie. The Galaxy J7 is only slightly ahead of the Selfie, and the Intel-inside Zenfone 2 isn't quite up to the same standard in the CPU parts of the benchmark. Moving on to graphics performance, the Zenfone Selfie shows some weaknesses. Never doing too well with FullHD screens the Adreno 405 posts lower numbers in GFXBench, even for its standards. A couple of fps behind the Moto X Play in the lighter T-Rex test and a few tenths of a frame in the more demanding Manhattan test aren't deal-breakers, but ruin the overall impression of a well-optimized Snapdragon 615 device. The charts clearly show that either of the Zenfone 2's with their PowerVR G6430 are a much better option for intense 3D rendering. The Galaxy J7 does beat the Selfie in onscreen tests, but it's the lower 720p resolution that helps its cause. In Basemark X the Zenfone Selfie sticks closer to its S615 brethren, comfortably ahead of the Galaxy J7, but still no match for the assorted Zenfone 2's. General web browsing performance, tested by BrowserMark 2.1, doesn't look too good either. Ahead of the Xperia C5 Ultra, the Selfie is nowhere near the Moto X Play, which is also beaten by the Galaxy J7. To sum it all up, the Zenfone Selfie's benchmark run is a mixed bag. Starting well in the CPU tests and going strong in compound benchmarks, it's trailing in graphics performance and scores below average numbers in browser tests.